^ a b Zebker, Howard A.; Stiles, Bryan; Hensley, Scott; Lorenz, Ralph; Kirk, Randolph L.; Lunine, Jonathan (2009). “Size and Shape of Saturn's Moon Titan”. Science 324 (5929): 921–923. doi:10.1126/science.1168905. http://science.sciencemag.org/content/324/5929/921. ^ a b c Jacobson, R. A.; Antreasian, P. G.; Bordi, J. J.; Criddle, K. E.; Ionasescu, R.; Jones, J. B.; Mackenzie, R. A.; Meek, M. C. et al. (December 2006). “The Gravity Field of the Saturnian System from Satellite Observations and Spacecraft Tracking Data”. The Astronomical Journal 132 (6): 2520–2526. Bibcode: 2006AJ....132.2520J. doi:10.1086/508812. http://iopscience.iop.org/1538-3881/132/6/2520/fulltext. ^ Mitri, G.; Showman, Adam P.; Lunine, Jonathan I.; Lorenz, Ralph D. (2007). 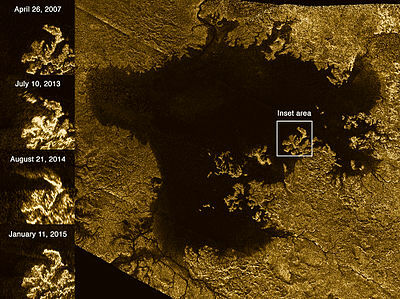 “Hydrocarbon Lakes on Titan”. Icarus 186 (2): 385–394. Bibcode: 2007Icar..186..385M. doi:10.1016/j.icarus.2006.09.004. オリジナルのFebruary 27, 2008時点によるアーカイブ。. http://www.lpl.arizona.edu/~showman/publications/mitri-etal-2007-lakes.pdf. ^ a b Niemann, H. B.; Atreya, S. K.; Bauer, S. J.; Carignan, G. R.; Demick, J. E.; Frost, R. L.; Gautier, D.; Haberman, J. A. et al. (2005). 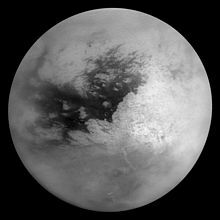 “The abundances of constituents of Titan's atmosphere from the GCMS instrument on the Huygens probe”. Nature 438 (7069): 779–784. Bibcode: 2005Natur.438..779N. doi:10.1038/nature04122. PMID 16319830. https://deepblue.lib.umich.edu/bitstream/2027.42/62703/1/nature04122.pdf. ^ a b c Coustenis & Taylor (2008), pp. 154–155. ^ a b c d e 渡辺潤一 (2012), p. 167. ^ 松田佳久 (2011), pp. 85. ^ a b 長沼毅 & 井田茂 (2014), pp. 143-155. ^ Nemiroff, R.; Bonnell, J., eds. (2005-03-25). "Huygens Discovers Luna Saturni". Astronomy Picture of the Day. NASA. Retrieved 2018年11月30日. ^ Cassini, G. D. (1673). “A Discovery of two New Planets about Saturn, made in the Royal Parisian Observatory by Signor Cassini, Fellow of both the Royal Societys, of England and France; English't out of French”. Philosophical Transactions 8 (1673): 5178–5185. doi:10.1098/rstl.1673.0003. ^ a b Lassell (1847-11-12). “Observations of Mimas, the closest and most interior satellite of Saturn”. Monthly Notices of the Royal Astronomical Society 8 (3): 42–43. Bibcode: 1848MNRAS...8...42L. doi:10.1093/mnras/8.3.42. http://adsabs.harvard.edu//full/seri/MNRAS/0008//0000042.000.html. ^ Herschel, Sir John F. W. (1847). Results of astronomical observations made during the years 1834, 5, 6, 7, 8, at the Cape of Good Hope : being the completion of a telescopic survey of the whole surface of the visible heavens, commenced in 1825. London: Smith, Elder & Co.. pp. 415. https://archive.org/stream/Resultsastronom00Hers#page/414/mode/2up/search/Titan. ^ a b c Bevilacqua, R.; Menchi, O.; Milani, A.; Nobili, A. M.; Farinella, P. (1980). “Resonances and close approaches. I. The Titan-Hyperion case”. 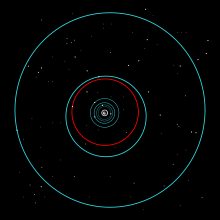 Earth, Moon, and Planets 22 (2): 141–152. Bibcode: 1980M&P....22..141B. doi:10.1007/BF00898423. ^ Tobie, G.; Grasset, Olivier; Lunine, Jonathan I.; Mocquet, Antoine; Sotin, Christophe (2005). “Titan's internal structure inferred from a coupled thermal-orbital model”. Icarus 175 (2): 496–502. Bibcode: 2005Icar..175..496T. doi:10.1016/j.icarus.2004.12.007. ^ a b c d e Longstaff, Alan (2009). “Is Titan (cryo)volcanically active?”. Royal Observatory, Greenwich (Astronomy Now): 19. ^ Iess, L.; Jacobson, R. A.; Ducci, M.; Stevenson, D. J.; Lunine, J. I.; Armstrong, J. W.; Asmar, S. W.; Racioppa, P. et al. (2012). “The Tides of Titan”. Science 337 (6093): 457–459. Bibcode: 2012Sci...337..457I. doi:10.1126/science.1219631. PMID 22745254. ^ Zebker, H. A.; Stiles, B.; Hensley, S.; Lorenz, R.; Kirk, R. L.; Lunine, J. (2009). “Size and Shape of Saturn's Moon Titan”. Science 324 (5929): 921–923. Bibcode: 2009Sci...324..921Z. doi:10.1126/science.1168905. PMID 19342551. ^ a b Hemingway, D.; Nimmo, F.; Zebker, H.; Iess, L. (2013). “A rigid and weathered ice shell on Titan”. Nature 500 (7464): 550–552. Bibcode: 2013Natur.500..550H. doi:10.1038/nature12400. PMID 23985871. ^ Coustenis & Taylor (2008), p. 130. ^ Zubrin, Robert (1999). Entering Space: Creating a Spacefaring Civilization. Section: Titan: Tarcher/Putnam. pp. 163–166. ISBN 1-58542-036-0. ^ Schröder, S. E.; Tomasko, M. G.; Keller, H. U. (2005). “The reflectance spectrum of Titan's surface as determined by Huygens”. American Astronomical Society, DPS meeting No. 37, #46.15; Bulletin of the American Astronomical Society 37 (726): 726. Bibcode: 2005DPS....37.4615S. ^ a b Waite, J. H.; Cravens, T. E.; Coates, A. J.; Crary, F. J.; Magee, B.; Westlake, J. (2007). “The Process of Tholin Formation in Titan's Upper Atmosphere”. Science 316 (5826): 870–875. Bibcode: 2007Sci...316..870W. doi:10.1126/science.1139727. PMID 17495166. ^ Coustenis, A. (2005). 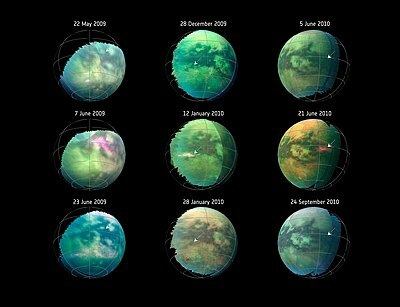 “Formation and evolution of Titan’s atmosphere”. Space Science Reviews 116 (1–2): 171–184. Bibcode: 2005SSRv..116..171C. doi:10.1007/s11214-005-1954-2. ^ Atreyaa, Sushil K.; Adamsa, Elena Y.; Niemann, Hasso B.; Demick-Montelar, Jaime E. a; Owen, Tobias C.; Fulchignoni, Marcello; Ferri, Francesca; Wilson, Eric H. (2006). “Titan's methane cycle”. Planetary and Space Science 54 (12): 1177–1187. Bibcode: 2006P&SS...54.1177A. doi:10.1016/j.pss.2006.05.028. ^ Stofan, E. R. et al. (2007). “The lakes of Titan”. Nature 445 (7123): 61–64. Bibcode: 2007Natur.445...61S. doi:10.1038/nature05438. PMID 17203056. ^ Tobie, Gabriel; Lunine, Jonathan; Sotin, Cristophe (2006). “Episodic outgassing as the origin of atmospheric methane on Titan”. Nature 440 (7080): 61–64. Bibcode: 2006Natur.440...61T. doi:10.1038/nature04497. PMID 16511489. 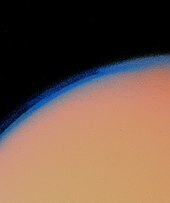 ^ a b Faint sunlight enough to drive weather, clouds on Saturn’s moon Titan Archived April 3, 2017, at the Wayback Machine. Between the large distance from the Sun and the thick atmosphere, Titan's surface receives about 0.1 percent of the solar energy that Earth does. ^ Cottini, V.; Nixon, C. A.; Jennings, D. E.; Anderson, C. M.; Gorius, N.; Bjoraker, G. L.; Coustenis, A.; Teanby, N. A. et al. (2012). 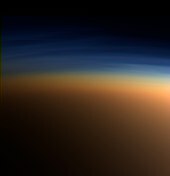 “Water vapor in Titan’s stratosphere from Cassini CIRS far-infrared spectra”. Icarus 220 (2): 855–862. Bibcode: 2012Icar..220..855C. doi:10.1016/j.icarus.2012.06.014. ISSN 0019-1035. ^ McKay, C. P.; Pollack, J. B.; Courtin, R. (1991). “The greenhouse and antigreenhouse effects on Titan”. Science 253 (5024): 1118–1121. doi:10.1126/science.11538492. PMID 11538492. ^ Emily L., Schaller; Brouwn, Michael E.; Roe, Henry G.; Bouchez, Antonin H. (2006). 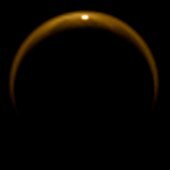 “A large cloud outburst at Titan's south pole”. Icarus 182 (1): 224–229. Bibcode: 2006Icar..182..224S. doi:10.1016/j.icarus.2005.12.021. http://www.gps.caltech.edu/~mbrown/papers/ps/largecloud.pdf. ^ Shiga, David (2006). 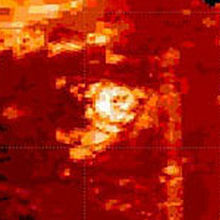 “Huge ethane cloud discovered on Titan”. New Scientist 313: 1620. https://www.newscientist.com/article/dn10073-huge-ethane-cloud-discovered-on-titan.html. ^ Mahaffy, Paul R. (2005). “Intensive Titan Exploration Begins”. Science 308 (5724): 969–970. Bibcode: 2005Sci...308..969M. doi:10.1126/science.1113205. PMID 15890870. ^ Moore, J. M.; Pappalardo, R. T. (2011). “Titan: An exogenic world”. Icarus 212 (2): 790–806. Bibcode: 2011Icar..212..790M. doi:10.1016/j.icarus.2011.01.019. ^ Lorenz, R. D.; Callahan, P. S.; Gim, Y.; Alberti, G.; Flamini, E.; Seu, R.; Picardi, G.; Orosei, R. et al. (2007). “Titan's Shape, Radius and Landscape from Cassini Radar Altimetry”. Lunar and Planetary Science Conference 38: 1329. Bibcode: 2007LPI....38.1329L. http://www.lpi.usra.edu/meetings/lpsc2007/pdf/1329.pdf. ^ Barnes, Jason W.; Brown, Robert H.; Soderblom, Laurence; Buratti, Bonnie J.; Sotin, Christophe; Rodriguez, Sebastien; Le Mouèlic, Stephane; Baines, Kevin H. et al. (2006). “Global-scale surface spectral variations on Titan seen from Cassini/VIMS”. Icarus 186 (1): 242–258. Bibcode: 2007Icar..186..242B. doi:10.1016/j.icarus.2006.08.021. http://c3po.barnesos.net/publications/papers/Titan.spectral.diversity.pdf. ^ Le Gall, A.; Malaska, M. J. (2016). 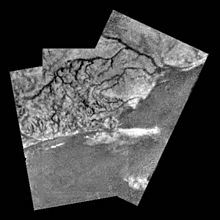 “Composition, seasonal change, and bathymetry of Ligeia Mare, Titan, derived from its microwave thermal emission”. Journal of Geophysical Research 121 (2): 233–251. Bibcode: 2016JGRE..121..233L. doi:10.1002/2015JE004920. http://onlinelibrary.wiley.com/doi/10.1002/2015JE004920/full. ^ Dermott, S. F.; Sagan, C. (1995). 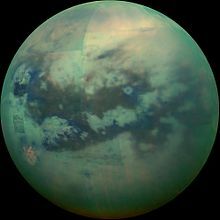 “Tidal effects of disconnected hydrocarbon seas on Titan”. Nature 374 (6519): 238–240. Bibcode: 1995Natur.374..238D. doi:10.1038/374238a0. PMID 7885443. ^ a b c Stofan, E. R.; Elachi, C.; Lunine, J. I.; Lorenz, R. D.; Stiles, B.; Mitchell, K. L.; Ostro, S.; Soderblom, L. et al. (2007). 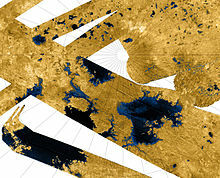 “The lakes of Titan”. Nature 445 (1): 61–64. Bibcode: 2007Natur.445...61S. doi:10.1038/nature05438. PMID 17203056. ^ Wye, L. C.; Zebker, H. A.; Lorenz, R. D. (2009). “Smoothness of Titan's Ontario Lacus: Constraints from Cassini RADAR specular reflection data”. Geophysical Research Letters 36 (16): L16201. Bibcode: 2009GeoRL..3616201W. doi:10.1029/2009GL039588. ^ Valerio Poggiali; Marco Mastrogiuseppe; Alexander G. Hayes; Roberto Seu; Samuel P. D. Birch; Ralph Lorenz; Cyril Grima; Jason D. Hofgartner (2016). “Liquid-filled Canyons on Titan”. Geophysical Reserach Letters. doi:10.1002/2016GL069679. http://onlinelibrary.wiley.com/doi/10.1002/2016GL069679/abstract. ^ Mitri, Giuseppe; Meriggiola, Rachele; Hayes, Alex; Lefevree, Axel; Tobie, Gabriel; Genovad, Antonio; Lunine, Jonathan I.; Zebker, Howard (2014). “Shape, topography, gravity anomalies and tidal deformation of Titan”. Icarus 236: 169–177. Bibcode: 2014Icar..236..169M. doi:10.1016/j.icarus.2014.03.018. ^ a b c d Wood, C. A.; Loren, R.; Kirk, R.; Lopes, R.; Mitchell, K.; Stofan, E.; The Cassini RADAR Team (2009). “Impact craters on Titan”. Icarus 206 (1): 334–344. Bibcode: 2010Icar..206..334L. doi:10.1016/j.icarus.2009.08.021. ^ Lucas, Antoine; Aharonson, Oded; Deledalle, Charles; Hayes, Alexander G.; Kirk, Randolph; Howington-Kraus, Elpitha (2014). 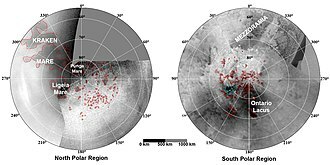 “Insights into Titan's geology and hydrology based on enhanced image processing of Cassini RADAR data”. Journal of Geophysical Research 119 (10): 2149–2166. Bibcode: 2014JGRE..119.2149L. doi:10.1002/2013JE004584. https://agupubs.onlinelibrary.wiley.com/doi/full/10.1002/2013JE004584. ^ Ivanov, B. A.; Basilevsky, A. T.; Neukum, G. (1997). “Atmospheric entry of large meteoroids: implication to Titan”. Planetary and Space Science 45 (8): 993–1007. Bibcode: 1997P&SS...45..993I. doi:10.1016/S0032-0633(97)00044-5. ^ a b Artemieva, Natalia; Lunine, Jonathan (2003). “Cratering on Titan: impact melt, ejecta, and the fate of surface organics”. Icarus 164 (2): 471–480. Bibcode: 2003Icar..164..471A. doi:10.1016/S0019-1035(03)00148-9. ^ Owen, Tobias (2005). 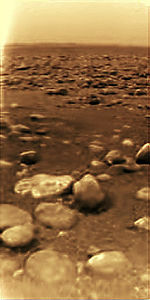 “Planetary science: Huygens rediscovers Titan”. Nature 438 (7069): 756–757. Bibcode: 2005Natur.438..756O. doi:10.1038/438756a. PMID 16363022. ^ a b Moore, J. M.; Pappalardo, R. T. (2008). “Titan: Callisto With Weather?”. American Geophysical Union, Fall Meeting 11: 6. Bibcode: 2008AGUFM.P11D..06M. ^ Sotin, C.; Jaumann, R.; Buratti, B.; Brown, R.; Clark, R.; Soderblom, L.; Baines, K.; Bellucci, G. et al. (2005). “Release of volatiles from a possible cryovolcano from near-infrared imaging of Titan”. Nature 435 (7043): 786–789. Bibcode: 2005Natur.435..786S. doi:10.1038/nature03596. PMID 15944697. ^ LeCorre, L.; LeMouélic, S.; Sotin, C. (2008). “Cassini/VIMS observations of cryo-volcanic features on Titan”. Lunar and Planetary Science XXXIX. http://www.lpi.usra.edu/meetings/lpsc2008/pdf/1932.pdf. ^ Shiga, David (2009-03-28). “Giant 'ice flows' bolster case for Titan's volcanoes”. New Scientist. ^ Fortes, A. D.; Grindroda, P. M.; Tricketta, S. K.; Vočadloa, L. (2007). “Ammonium sulfate on Titan: Possible origin and role in cryovolcanism”. Icarus 188 (1): 139–153. Bibcode: 2007Icar..188..139F. doi:10.1016/j.icarus.2006.11.002. ^ Roe, H. G. (2004). 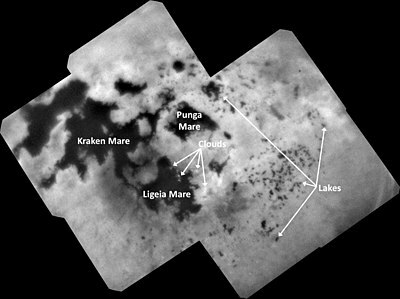 “A new 1.6-micron map of Titan's surface”. Geophys. Res. Lett. 31 (17): L17S03. Bibcode: 2004GeoRL..3117S03R. doi:10.1029/2004GL019871. ^ Lorenz, R. (2003). “The Glitter of Distant Seas”. Science 302 (5644): 403–404. doi:10.1126/science.1090464. PMID 14526089. ^ Lorenz, R. D. (2010). 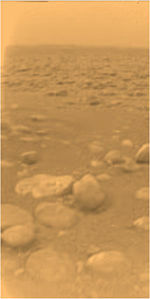 “Winds of Change on Titan”. Science 329 (5991): 519–520. Bibcode: 2010Sci...329..519L. doi:10.1126/science.1192840. PMID 20671175. ^ a b Lorenz, R. D.; Wall, S.; Radebaugh, J.; Boubin, G.; Reffet, E.; Janssen, M.; Stofan, E.; Lopes, R. et al. (2006). 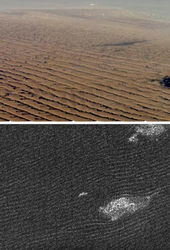 “The sand seas of Titan: Cassini RADAR observations of longitudinal dunes”. Science 312 (5774): 724–727. Bibcode: 2006Sci...312..724L. doi:10.1126/science.1123257. PMID 16675695. ^ Lancaster, N. (2006). “Linear Dunes on Titan”. Science 312 (5774): 702–703. doi:10.1126/science.1126292. PMID 16675686. ^ “Electrified sand could explain Titan's backward dunes”. New Scientist: 18. (2017-04-01). ^ Rodriguez, S.; Le Mouélic, S.; Barnes, J. W.; Kok, J. F.; Rafkin, S. C. R.; Lorenz, R. D.; Charnay, B.; Radebaugh, J. et al. (2018). “Observational evidence for active dust storms on Titan at equinox”. Nature Geoscience. doi:10.1038/s41561-018-0233-2. ^ Benton (2005), pp. 141-146. ^ Kuiper, G. P. (1944). “Titan: a Satellite with an Atmosphere”. Astrophysical Journal 100: 378. Bibcode: 1944ApJ...100..378K. doi:10.1086/144679. ^ Bell (2015), pp. 93. ^ Richardson, J.; Lorenz, Ralph D.; McEwen, Alfred (2004). “Titan's Surface and Rotation: New Results from Voyager 1 Images”. Icarus 170 (1): 113–124. Bibcode: 2004Icar..170..113R. doi:10.1016/j.icarus.2004.03.010. ^ Bell (2015), pp. 94. ^ Lingard, Steve; Norris, Pat (2015). How To Land on Titan. Ingenia. http://www.ingenia.org.uk/ingenia/articles.aspx?Index=317. ^ Urdampilleta, I.; Prieto-Ballesteros, O.; Rebolo, R. et al., eds (2012). “TALISE: Titan Lake In-situ Sampling Propelled Explorer”. European Planetary Science Congress 2012. 7, EPSC2012-64 2012. EPSC Abstracts. http://meetingorganizer.copernicus.org/EPSC2012/EPSC2012-64.pdf. ^ Hartwig, J., et al., (June 24–26, 2015). "Titan Submarine: Exploring the Depths of Kraken Mare", 26th Space Cryogenics Workshop, Phoenix, Arizona. link to NASA Report. Retrieved 13 June 2017. ^ a b c Titan is thought by some scientists to be a possible host for microbial extraterrestrial life. Grasset, O.; Sotin, C.; Deschamps, F. (2000). “On the internal structure and dynamic of Titan”. Planetary and Space Science 48 (7–8): 617–636. Bibcode: 2000P&SS...48..617G. doi:10.1016/S0032-0633(00)00039-8. ^ a b c Fortes, A. D. (2000). “Exobiological implications of a possible ammonia-water ocean inside Titan”. Icarus 146 (2): 444–452. Bibcode: 2000Icar..146..444F. doi:10.1006/icar.2000.6400. ^ a b Raulin, F. (2005). “Exo-astrobiological aspects of Europa and Titan: From observations to speculations”. Space Science Reviews 116 (1–2): 471–487. Bibcode: 2005SSRv..116..471R. doi:10.1007/s11214-005-1967-x. ^ a b Raulin, F.; Owen, T. (2002). “Organic chemistry and exobiology on Titan”. Space Science Reviews 104 (1–2): 377–394. Bibcode: 2002SSRv..104..377R. doi:10.1023/A:1023636623006. ^ Desai, R. T.; A. J. Coates; A. Wellbrock; V. Vuitton; D. González-Caniulef et al. (2017). “Carbon Chain Anions and the Growth of Complex Organic Molecules in Titan's Ionosphere”. Astrophysics Journal Letter 844 (2): L18. arXiv:1706.01610. Bibcode: 2017ApJ...844L..18D. doi:10.3847/2041-8213/aa7851. ^ Zhao, Long et al. (2018). “Low-temperature formation of polycyclic aromatic hydrocarbons in Titan’s atmosphere”. Nature Astronomy (2): 973-979. https://www.nature.com/articles/s41550-018-0585-y. ^ Artemivia, N.; Lunine, J (2003). “Cratering on Titan: impact melt, ejecta, and the fate of surface organics”. Icarus 164 (2): 471–480. Bibcode: 2003Icar..164..471A. doi:10.1016/S0019-1035(03)00148-9. ^ Lovett, Richard A. (2008-03-20). “Saturn Moon Titan May Have Underground Ocean”. National Geographic. 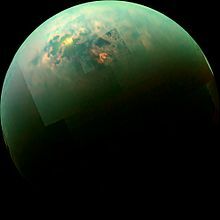 http://news.nationalgeographic.com/news/2008/03/080320-titan-ocean_2.html. ^ a b c d McKay, C. P.; Smith, H. D. (2005). “Possibilities for methanogenic life in liquid methane on the surface of Titan”. Icarus 178 (1): 274–276. Bibcode: 2005Icar..178..274M. doi:10.1016/j.icarus.2005.05.018. ^ Strobel, Darrell F. (2010). “Molecular hydrogen in Titan's atmosphere: Implications of the measured tropospheric and thermospheric mole fractions”. Icarus 208 (2): 878–886. Bibcode: 2010Icar..208..878S. doi:10.1016/j.icarus.2010.03.003. オリジナルの2012-08-24時点によるアーカイブ。. https://web.archive.org/web/20120824195338/http://astrobiology.jhu.edu/wp-content/uploads/2010/06/Icarus-2010-Strobel.pdf. ^ Stevenson, James; Lunine, Jonathan; Clancy, Paulette (2015). “Membrane alternatives in worlds without oxygen: Creation of an azotosome”. Science Advances 1 (1): e1400067. Bibcode: 2015SciA....1E0067S. doi:10.1126/sciadv.1400067. PMC: 4644080. PMID 26601130. https://www.ncbi.nlm.nih.gov/pmc/articles/PMC4644080/. ^ Gladman, Brett; Dones, Luke; Levinson, Harold F.; Burns, Joseph A. (2005). “Impact Seeding and Reseeding in the Inner Solar System”. Astrobiology 5 (4): 483–496. Bibcode: 2005AsBio...5..483G. doi:10.1089/ast.2005.5.483. PMID 16078867. Coustenis, Athéna; Taylor, F. W. (2008). Titan: Exploring an Earthlike World. World Scientific. ISBN 978-981-270-501-3. https://books.google.com/?id=j3O47dxrDAQC&printsec=frontcover. Benton, Julius L. Jr. (2005). Saturn and How to Observe It. London: Springer. ISBN 978-1-84628-045-0. http://www.springerlink.com/content/t7887977563172w5/. Bell, Jim (2015). The Interstellar Age: Inside the Forty-Year Voyager Mission. Penguin Publishing Group. ISBN 978-0-698-18615-6. https://books.google.com/books?id=KXPoAwAAQBAJ&pg=PT93. Lorenz, Ralph; Mitton, Jacqueline (2002). Lifting Titan's Veil: Exploring the Giant Moon of Saturn. Cambridge University Press. ISBN 0-521-79348-3. Lorenz, Ralph; Mitton, Jacqueline (2008). Titan Unveiled. Princeton University Press. ISBN 978-0691146331. Lorenz, Ralph (2017). 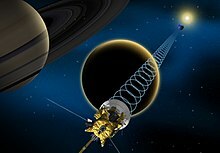 NASA/ESA/ASI Cassini-Huygens: 1997 onwards (Cassini orbiter, Huygens probe and future exploration concepts) (Owners' Workshop Manual). Haynes Manuals, UK. ISBN 978-1785211119. European Space Agency. (2005). 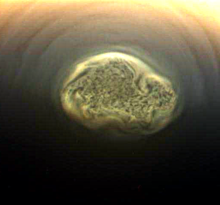 ESA—Cassini–Huygens. Retrieved March 28, 2005. The Planetary Society (2005). 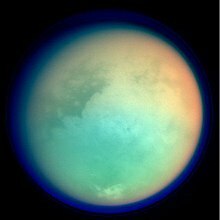 TPS: Saturn's moon Titan. Retrieved March 28, 2005. University of Arizona Lunar and Planetary Lab (2005). 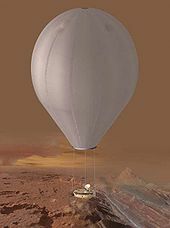 Lunar and Planetary Lab The Descent Imager-Spectral Radiometer of the Cassini–Huygens Mission to Titan. Retrieved March 28, 2005. The Alien Noise. This recording is a laboratory reconstruction of the sounds heard by Huygens' microphones. AstronomyCast: Titan Fraser Cain and Pamela Gay, 2010.